Time travel is a dangerous thing. There’s always the chance of stepping on a bug in the past and changing the course of history, and knowing too much about the future can have a direct impact on the present. The Justice League has had its time-related headaches in the past, but “The Once And Future Thing” broadens the scope of the time travel to send Batman, Green Lantern, and Wonder Woman to different eras of the DCAU as they chase David “Chronos” Clinton, a physics professor turned thief of precious historical artifacts. Their journey takes them to the Wild West, 1879, where they meet DC Western heroes like Batlash, El Diablo, Jonah Hex, and Ohiyesa “Pow Wow” Smith, and 50 years into the future, where they meet the new Justice League Unlimited of Batman Beyond, Static, Warhawk, and elderly Bruce Wayne. It’s an astounding way to end this show’s first season, paying tribute to the rich history of DC’s characters while planting some significant seeds to be explored in the future. “The Once And Future Thing” is JLU’s first two-parter, and writer Dwayne McDuffie crafts a sprawling narrative that deserves the extra length. It’s nearly impossible to top the DCAU’s first foray into the Western genre, but “Weird Western Tales” gets extra points for digging deep into DC’s cache of characters to showcase just how cool these retro-styled heroes still are. 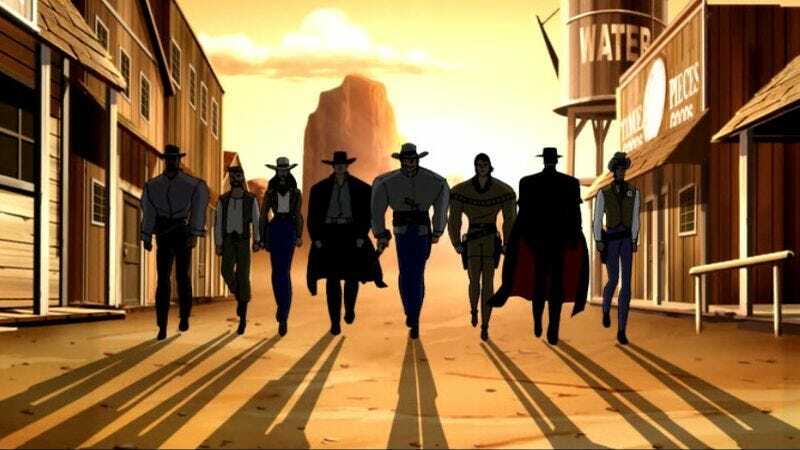 DC’s Western characters were the superheroes of this universe before aliens and superpowered human started putting on costumes, and this episode treats them like new members of the Justice League, going so far as to remix the show’s theme Elmer Bernstein-style when the group walks through the town street in Magnificant Seven formation. Dwayne McDuffie’s major strengths as a writer were outlined last week, and his balance of action, drama, and comedy is on full display in “The Once And Future Thing.” He wisely chooses to begin the episode on an intimate, personal level, showing David and his nagging wife Enid in a domestic argument about the junk he’s been accumulating, immediately establishing the pathetic motivation for Chronos’ crime spree. David fully commits to a life of time-manipulating tyranny when his wife chews him out for not using his new technology to get rich and powerful, and she ultimately gets what she wants at the cost of her own freedom. The focus remains on character relationships when the scene shifts to the Justice League’s heroes, who are adjusting to some of the recent changes around the Watchtower. Shayera is back as a permanent member of the team, and Diana is holding a grudge against her duplicitous teammate while John is battling his romantic feelings for his returned ex-girlfriend. As Batman tries to cajole an admission of affection from his teammate, John responds by calling Batman out on his relationship with Diana, setting up the romantic drama that provides the emotional backbone of this episode in the second half. The first half of “The Once And Future Thing” shifts into action mode when Chronos breaks into the Watchtower and steals Batman’s belt, with the Dark Knight, Green Lantern, and Wonder Woman jumping through a time portal that takes them to 19th century Oklahoma. They’re immediately held up by road bandits upon entering this new era, but they disarm the thieves and steal their clothes so they can fit in when they go to town for more information. Elkhorn has been taken over by Tobias Manning, a criminal who has somehow gained a futuristic gun that he uses to terrorize gambler-gunslinger Bartholomew Aloysius Lash at the poker table. The League learns that Chronos has been in the Elkhorn jail for nearly six months when they rescue Bat Lash, and in order to get home they need to retrieve Chronos’ belt from Manning and remove all the chronological corruptions the villain has pulled from the timestream for protection. Jonah Hex, El Diablo, and former Elkhorn Sheriff Ohiyesa Smith arrive to help the League break Bat Lash out of prison, and the combined might of these seven heroes is enough to take out Manning’s army of gentleman robots, mechanical dinosaurs, and tanks from the 20th century. Director Dan Riba directs dynamic action sequences, but he has a much more conventional style than Joaquim Dos Santos, whose anime influence brings added visual flair to the second half of the episode. Riba’s traditional staging gives the first half a very classic cartoon feel, which fits the simplified story. “Weird Western Tales” is an opportunity for JLU to pay tribute to the history of DC Comics outside of superheroes, and the emphasis is on showing these characters in action. This story is mostly about El Diablo and Jonah Hex taking out robots in top hats and Ohiyesa Smith tackling a mechanical Pegasus, but the character drama comes back to the forefront when the three Leaguers follow Chronos into the future. Chronos’ henchmen The Jokerz ambush the Justice League before they can figure out what is going on, and it’s a beautifully choreographed fight sequence by Joaquim Dos Santos that is far more complex than the Western action. The angles are unconventional (I love that shot from inside Woof’s mouth), and the use of speed lines and dramatic lighting helps add depth and speed to movement. “Time, Warped” is a gorgeous episode thanks to the work of animation studio DR Movie Co., which provides cinema-quality visuals for each of its JLU episodes. The combination of DR’s crisp, detailed animation and Dos Santos’ kinetic, expressive direction make their partnerships the best looking installments of the series, and they bring the futuristic setting of this second part to vivid life. As Chronos begins to heavily manipulate the time stream, Diana disappears from existence and Hal Jordan replaces John Stewart in one of this show’s best fan-service moments. The vanishing of Diana provides extra motivation for Batman to take down Chronos and he charges into battle once his crush is put in danger, but it would have been nice to see present and future Bruce discuss their affections for Wonder Woman. Unfortunately, there’s not much time for small talk, so deeper character insights are lost in favor of spectacular action, but it’s clear that Bruce and John’s journey to the future impacts them when they finally return to the present. During their final fight with Chronos, John’s paternal side comes through when his son is attacked, and he takes a nasty cut on his head to save Warhawk. That mark is a visual reminder of what awaits John in the future, and when he and Batman reappear at their lunch table after tracking Chronos to the beginning of time, that cut is the only indicator that they traveled anywhere at all. 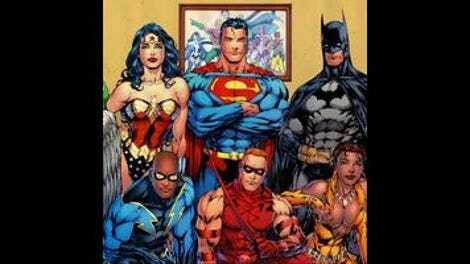 Diana has no recollection of the events when she sits next to Batman at the table, but her teammates aren’t so lucky. The existence of Warhawk will haunt John every time he sees Shayera, but there are far worse fates than fathering a son with a beautiful alien redhead. He could be stuck in a loop of spousal abuse like David Clinton, whose time-traveling device has been hacked by Batman so that he is forced to relive his wife’s shrill harassment for all time. Batman doesn’t kill because he doesn’t have to, he can just use his brain to create a punishment far more horrible than death. Mindy Sterling’s pitch-perfect voice work as Enid Clinton makes me even sadder about the lack of Lin Beifong in last week’s The Legend Of Korra season premiere. She’s a wonderful voice actress. A black man with a weapon that creates anything he can think of probably scared the holy hell out of Elkhorn’s citizens. Dwayne McDuffie wisely chooses to ignore the racial climate of the time period. Mark Waid’s current arc of The Indestructible Hulk shares a lot of similarities with this episode, sending Hulk to fix damage done to the timestream. Last month’s issue had him fighting dinosaurs in the Wild West while a trio of Marvel’s classic gunslingers helped him, which is basically the plot of the first half of McDuffie’s story.